The ultimate pizza for Alfredo lovers! 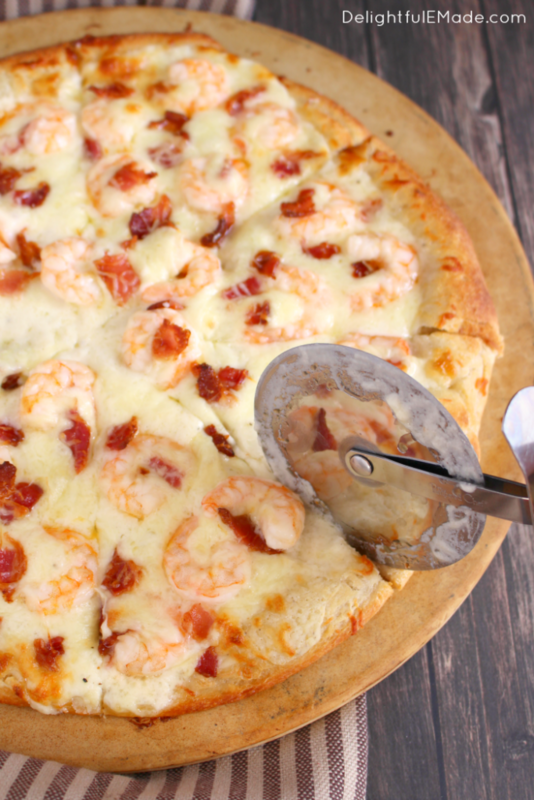 Loaded with tender shrimp, crisp bacon and lots of cheese, this pizza is the perfect way to enjoy all your favorite flavors on one delicious slice! 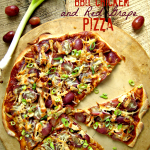 Do you and your family love homemade pizza? I have to say that we cannot get enough! 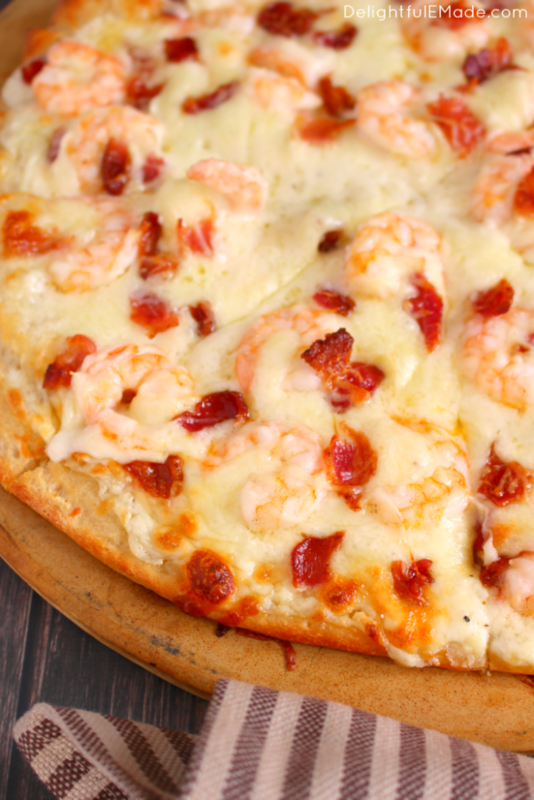 We also love making different variations of our favorites – this Shrimp & Bacon Alfredo is the brainchild of one of our many pizza experiments! White pizza (any pizza that uses a white or Alfredo sauce instead of a red pizza sauce) is one that my family, especially my 7-year-old son, absolutely loves! There is something about the sauce that creates this amazing canvas for the toppings! The Alfredo sauce melts right in with the mozzarella cheese and creates one gooey, cheesy delicious slice of heavenly pizza! 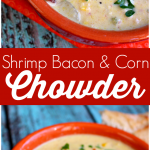 As for the pairing of shrimp and bacon – I have to give that credit to my husband, as he’s been a long-time fan of this classic savory, sweet pairing. 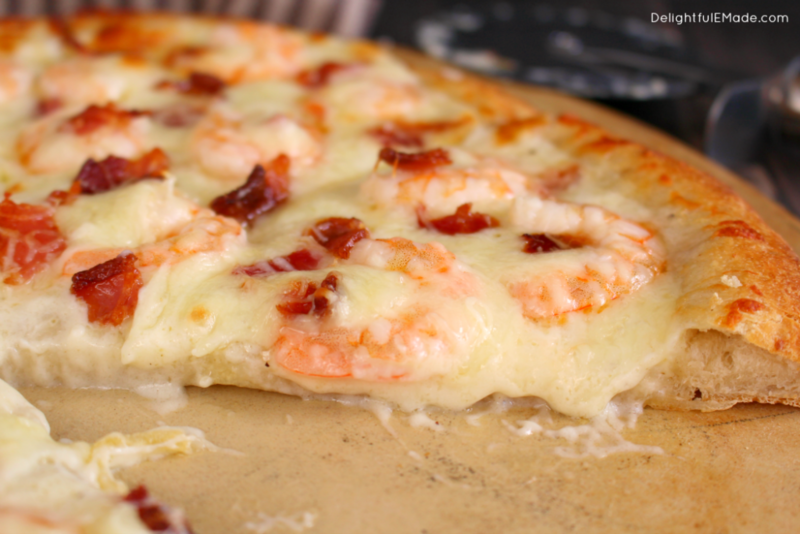 As you would expect, this shrimp and bacon duo makes for a spectacular pizza topping! 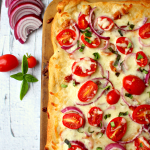 For this pizza, along with my White Pizza with Bacon and Tomatoes, I use my Easy Alfredo Sauce recipe! Ever since I started making my own Alfredo sauce several years ago, I’ve NEVER again bought another jar of the store-bought stuff. 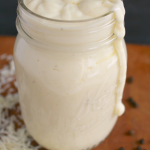 Homemade Alfredo sauce takes just a few minutes to make (like less than 10 minutes total! 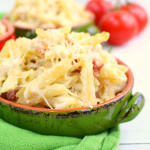 ), requires just a few ingredients, and the flavor is WAYYYYYYYY better! For the shrimp, I actually prefer frozen, raw shrimp that’s already been peeled and de-veined. 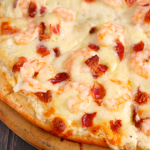 I’ve found that when you buy shrimp that has already been cooked, it gets very tough and chewy when it goes into the oven to bake with the rest of the pizza. For the bacon, I pre-cook about 4-6 slices (depending on the size of your pie) to a medium crispness. 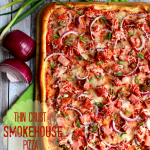 I wouldn’t recommend adding raw bacon to your pizza, as it won’t cook properly and will make your pizza overly greasy. The ultimate pizza for Alfredo lovers! 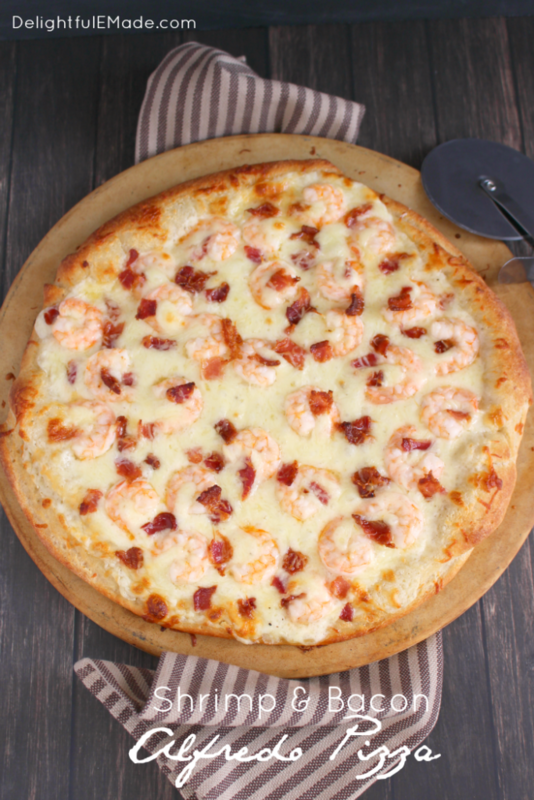 Loaded with tender shrimp, crisp bacon and lots of cheese, this pizza is the perfect way to enjoy all your favorite flavors one delicious slice! On a pizza pan or stone, roll out the pizza crust. Spread the Alfredo sauce over the dough leaving a 1/2" crust border. Next, sprinkle the cheese over the top of the sauce. 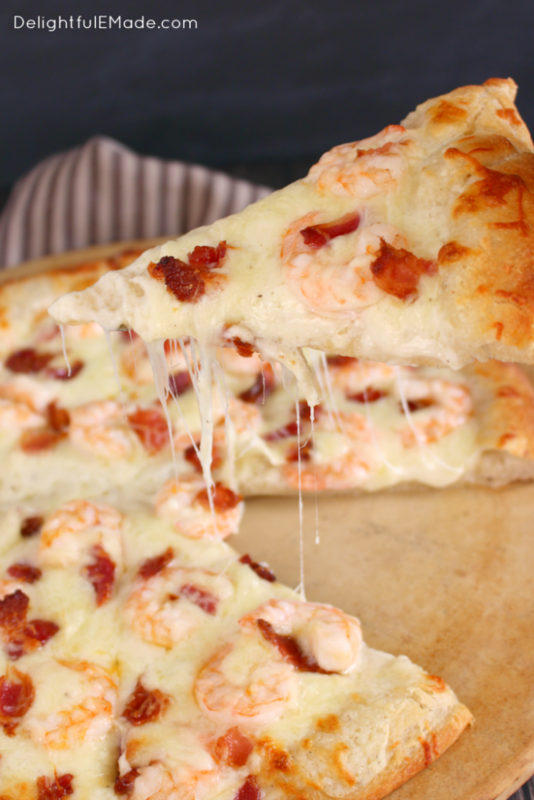 Top with the raw shrimp and bacon pieces. Bake in a 425 degree oven for 16-20 minutes or until cheese is golden brown. Remove from oven and let cool for about 5 minutes before slicing. Note: for the Alfredo Sauce, use the recipe for my Easy Alfredo Sauce. 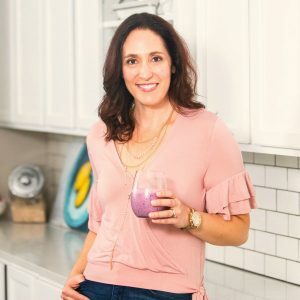 It takes just a few minutes to make and is much, much better than the jarred, store-bought stuff. I think this could potentially be my new favourite pizza topping. All the flavours I love together - I need to try this!